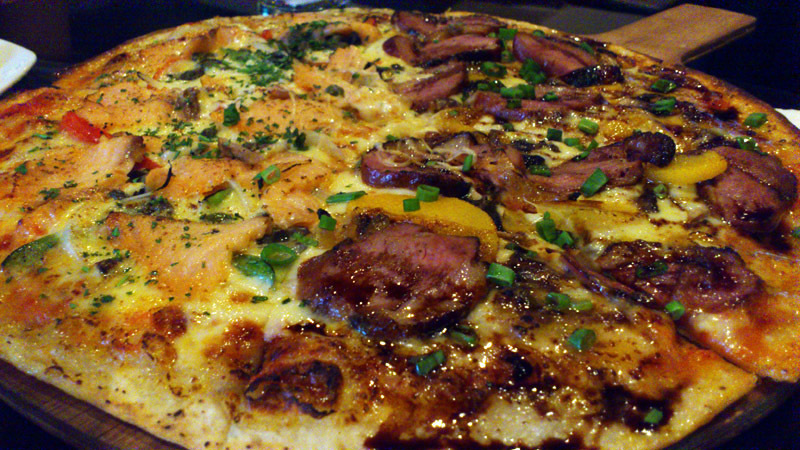 Half - Half Pizza which any 2 flavours on the menu can be chosen. I chose the Award Winning smoked duck & smoked salmon. As you can see, it is full of ingredients & tasty too! Damage was only RM 15++ after discount. 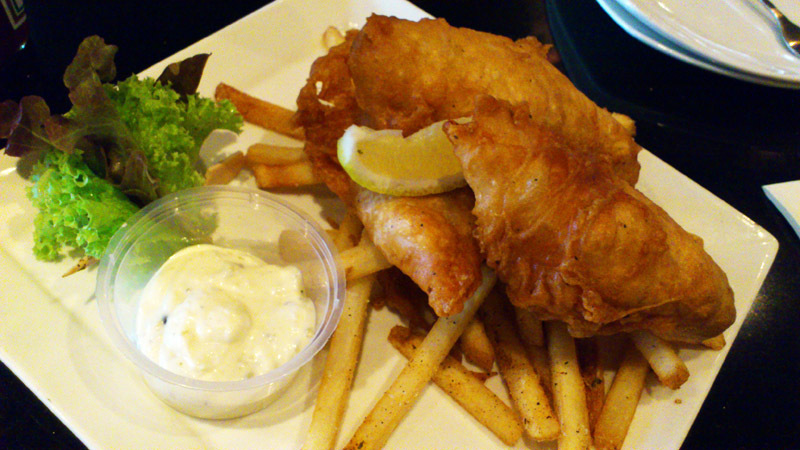 Traditional fish & chips which comes with beer battered white tuna fish with salad & fries. Batter seemed quite thick but not really sure if is normal as there are hardly anywhere serving beer battered. This HUGE portion only costed RM 12++! I would recommend going for Half - Half pizza anytime as not only can one try 2 flavours but some flavours actually costs more like the Unagi flavour which I think was RM 38. I especially liked the smoke duck as it tastes abit like caramelized roasted pork or ’siew yoke’ with the teriyaki sauce and peach. 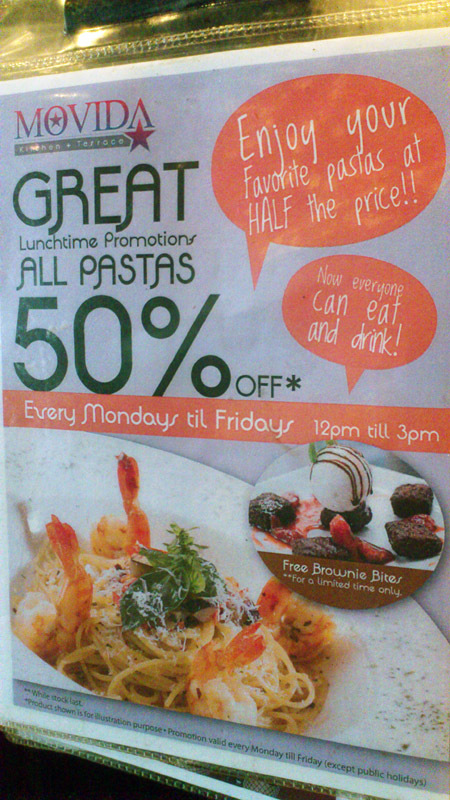 On a normal day from Mondays to Fridays from 12pm to 3pm, all pastas are going for 50% off! What’s more is that they are throwing in free Brownie Bites! In conjunction with achieving 100,000 likes in facebook, the popular chain pub Movida is having a special promotion for all loyal fans at all 6 outlets on Thursday 10 January 2013 for the whole day! They are selling all food items at 50% discount. To accompany it, all beers are going for buy 1 pint, free 2 pints! A note of caution though, some disco or pub ‘kaki’s’ maybe familiar on how to book tables but perhaps I do not go such places often enough as I never managed to book a place eventhough they may say is confirmed, be it Movida or Beer Factory which I have tried so far. However, I can say the food is pretty decent as I tried their set lunch before which comes with unlimited appetizers & dessert but sadly, they discontinued it. This entry was posted on Tuesday, January 8th, 2013 at 6:44 pm	and is filed under Food Promo, Heavenly Klang Valley Food, Pub and Bistro, set lunch. You can follow any responses to this entry through the RSS 2.0 feed. You can leave a response, or trackback from your own site.